Thank you for caring about the welfare of our planet and its inhabitants! 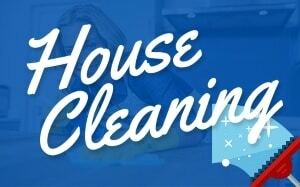 Using non-toxic home cleaning products is a major contribution. But how can you tell if a cleaner is entirely eco-friendly? Especially with the misleading practices, claims, and product labeling by manufacturers. This guide will give you a discerning eye, so you can make informed choices. Here’s how to spot safe household cleaners when shopping for your home and pets. Manufacturers can market their products as eco-friendly, even though they’re not. Making deceptive environmental claims is termed “greenwashing.” Cleaning products labeled “natural” can still be unsafe to use. For instance, formaldehyde is naturally present in our environment, but the chemical is poisonous at high concentrations. Another advertising strategy is using biodegradable or recyclable packaging. Meanwhile, the cleaners inside can cause permanent harm to people and our Earth’s creatures. Also, don’t be swayed by environmental motifs, such as green leaves. The terms “eco-friendly,” “green,” and “organic” must be validated by agency certification or full ingredient disclosure. 2. Favor products with eco-labels. An eco-label is a logo representing third-party certification of low environmental impact. The seal signifies that a product complies with regulation ISO14024, a globally recognized safety standard. Manufacturers voluntarily apply for eco-labels and must undergo company audits. When a cleaner is green-certified, it has passed stringent assessment by an environmental authority. In America, one third-party certifier is the Environmental Protection Agency (EPA), awarding the Safer Choice eco-label. This designation shows that all product ingredients are safe for humans and the planet. So, before buying a product, look for one of the above seals on packaging. To ensure a cleaning product hasn’t been tested on animals, look for the Leaping Bunny logo. While also featured on cosmetics, you may see this seal on household cleaners, such as bleach, dish detergent, laundry detergent, all-purpose cleaners, furniture polish, floor wax, and air fresheners. NOTE – Not all manufacturers have the resources to apply for green certification. Therefore, non-toxic cleaners exist that don’t have eco-labels. However, by reading product ingredients, you’ll gain clues to safety. 3. Look for label warnings. Did you know that in the US, manufacturers aren’t legally required to disclose all cleaning product components? Per the EPA, only ingredients known to be hazardous must be declared. This policy originated to protect the confidentiality of manufacturer formulas or “trade secrets,” such as fragrance. However, the government doesn’t test all products, so dangerous chemicals can lurk undetected. Manufacturers aren’t required to safety-test their ingredients either. The Food and Drug Administration doesn’t oversee cleaning products since they’re not meant for ingestion. Meanwhile, certain chemicals are linked to illness and disease, such as cancer, birth defects, asthma, and reproductive disorders. Plus, the word “fragrance” is merely a vague reference to scent, without specifying the source. Fragrance can be a synthetic mix of toxic and allergenic substances. Therefore, look for a warning label on any product you’re considering for purchase. Warning statements are required on cleaners that have known hazardous ingredients. Such advisories must include possible health risks, usage precautions, and first-aid instructions. Clues to harmful substances are the words poison, danger, corrosive, flammable, and irritant. Newsflash! – New York and California have paved the way to full ingredient disclosure by cleaning product manufacturers. 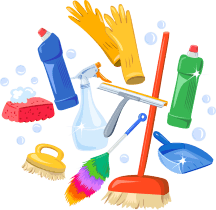 In April 2017, NY Governor Cuomo announced the Household Cleaning Product Information Disclosure Program. All ingredients must be revealed on manufacturer websites. Then, in October 2017, CA Governor Brown signed into law the Cleaning Product Right to Know Act. 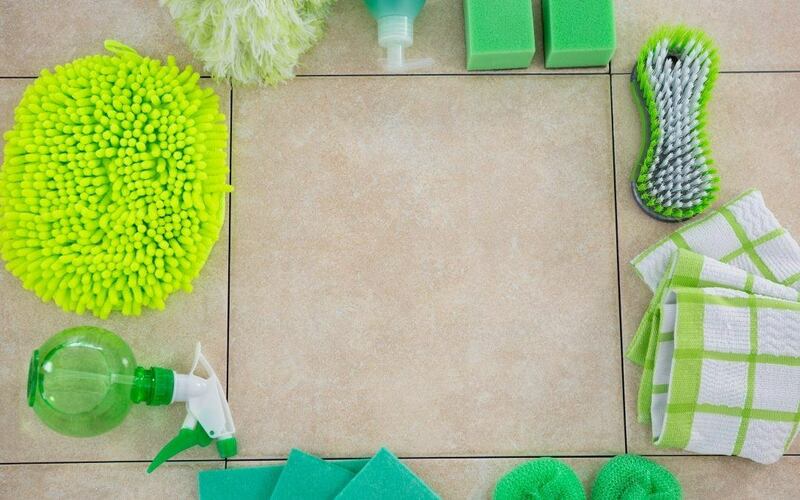 As of January 2020, California cleaning product manufacturers must disclose potentially hazardous ingredients on their websites. The same information must appear on product labels by January 2021. Companies can guard their trade secrets, provided the formulas don’t contain harmful chemicals. Ammonia – This chemical irritates skin and respiratory passages. Accidental mixing with acids, lye, and chlorine yields toxic vapors. Chlorine Bleach – The active ingredient sodium hypochlorite burns the eyes, throat, nasal passages, and lungs. Associated with reproductive disorders and cancer, it also poisons marine life. Formaldehyde Releasers – Acting as preservatives, these chemicals threaten immunity, damage skin, and promote cancer. Formaldehyde releasers are indicated on labels as quaternium-15, hydroxymethylglycinate, DMDM hydantoin, Glydant, diazolidinyl urea, bronopol, hexahydro-1,3,5-tris, Grotan, and imidazolidinyl urea. Petroleum Solvents – Labeled “surfactants,” these chemicals are irritating to the skin, eyes, nerves, and respiratory system. Phosphates – Often added to dish and laundry detergents, phosphates kill aquatic life. Phthalates – These components of synthetic fragrances interfere with hormones. Phthalates are linked to low sperm counts, birth defects, and breast cancer. Quaternary Ammonium Compounds – This umbrella term includes quaternium 1-29, cetrimonium bromide, stearalkonium chloride, and benzalkonium chloride. Abbreviated “quats,” these chemicals damage the skin and eyes and kill marine life. 1,4-dioxane – This byproduct of formula manufacture is linked to cancer, irritation of the eyes and respiratory tissues, and organ toxicity. 5. Scout labels for benign ingredients. 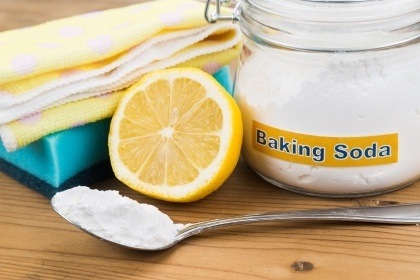 Baking Soda – deodorizes, polishes, removes grease, and eliminates mildew. Castile Soap – biodegradable and removes oil. Essential Oils – lemon, orange, and grapefruit impart fragrance and cut grease. Lemon Juice – antibacterial, cuts grease, and bleaches stains. Vinegar – deodorizes, polishes, cuts grease, disinfects, and removes mildew and mold. Also, look for the following terms on labels – phosphate-free, petroleum-free, solvent-free, and VOC-free. 6. Refer to the EWG Database. The Environmental Working Group (EWG) is a toxic product watchdog, based in the US. This non-profit organization includes scientists, lawyers, and policy experts, researching consumer products to separate the harmful from the benign. Their efforts promote honest product labeling, consumer awareness, human health, and planetary protection. 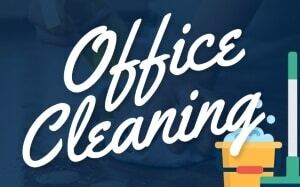 EWG has compiled a database of 2,000+ home cleaning products. When debating a purchase, search for the cleaner on the EWG website. If not present, enter any ingredients of concern in the Search box. See if the EWG has rated the substances. With the “A” through “F” grading system, you can determine the safety of product components. 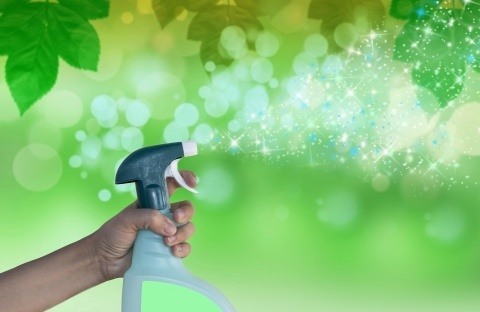 Alternatively, you can review EWG’s Top Green Cleaning Products. EWG scores reflect the presence of dangerous substances, their concentration, the extent of manufacturer disclosure, and whether a product is green-certified. An “A” rating signifies a low toxic risk and full ingredient disclosure. A grade of “C” means the cleaner poses no obvious toxic risk and declares some ingredients. An “F” signifies high toxicity, with meager to no ingredient disclosure. 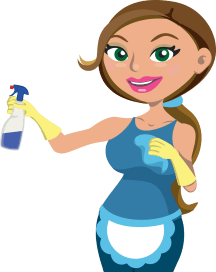 To find safe home cleaning products, you must be a savvy sleuth or think about making your own green cleaning products. Begin your assessment of a household cleaner by looking for an eco-label. Then, research the ingredients on the manufacturer’s website. Be alert to evidence of toxic versus benign substances. Note if the retailer has issued a warning statement. Next, see if EWG has reviewed the product by doing a database search. If so, note the rating. If the product scores well, it’s a safe choice. With some clever detective work, you can breathe easy!